In this short article, I will show you how you can save Macro to Personal Macro Workbook. Most macros are created for use in a specific workbook, but it is possible to use some macros in all your work. You can store these general-purpose macros in the Personal Macro Workbook so that these macros are always available to you. The Personal Macro Workbook is loaded whenever you start Excel. A file named personal.xlsb is created only after you have recorded a macro using Personal Macro Workbook as the destination. Note: Normally, the Personal Macro Workbook is in a hidden window. To record the macro in your Personal Macro Workbook, select the Personal Macro Workbook option in the Store macro in the drop-down menu in the Record Macro dialog box before you start macro recording. 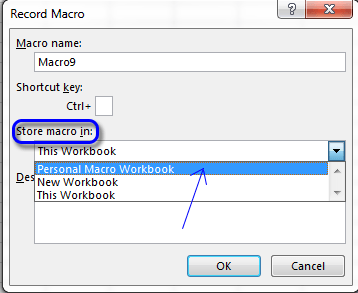 If you store macros in the Personal Macro Workbook, it will open automatically when you load a workbook that uses macros saved in the Personal Macro Workbook. When you will exit, Excel will ask whether you want to save changes (if you have changed anything) to the Personal Macro Workbook.